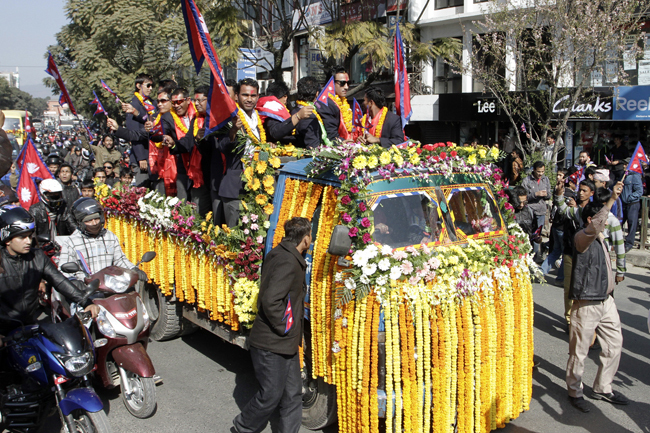 The Nepali National Cricket team players were taken in the procession rally along the major street of the Kathmandu on Wednesday. In the procession rally, they started at around the 12:00 pm in the afternoon from Hotel Crown Plaza and traversed through the Darbar Marg, Bagbazaar, Putalisadak and so on until the National Sports Council before reaching there. Music players was also played during the procession, which was organized by Nepal Cricket Association to celebrate Nepali Cricket team’s recent success at the 2014 ICC World Twenty20 Qualifier in UAE, where they have finished third and more importantly qualified for upcoming World Cup to be held on March in Bangladesh. At the meantime, there were participate thousands of fans and supporters of Nepali Cricket in the procession rally. Most of the fans were following from the Darbar Marg to National Sports Council and asking to improve the cricket for government and cricket players. Chief Secretary Lila Mani Poudel expressed commitment and peaking at the conclusion programme that the government would do its best in the development field and scope of Nepali Cricket. Why Paras Khadka did have emotional?